It is no secret that I love comfort but looking good too. Many mornings you can find me walking the trails in my neighbourhood, enjoying the scenery and getting my daily exercise in. But how to look great after the walk, when I need to go to the produce store or run errands? It is no secret that I love comfort but looking good too. Many mornings you can find me walking the trails in my neighbourhood, enjoying the scenery and getting my daily exercise in. But how to look great after the walk, when I need to go to the produce store or run errands? 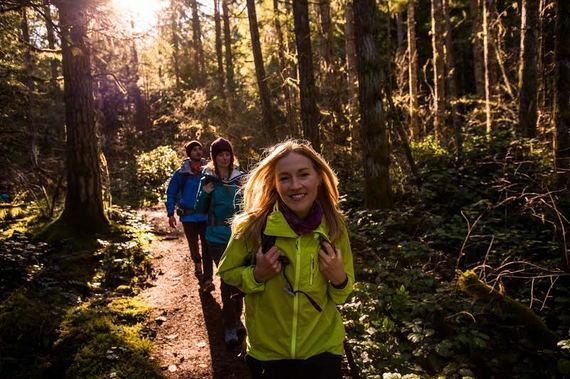 I recently spoke with Janna Bishop, Apparel Designer at Mountain Equipment Co-op and she shared with me how anyone can look great during a walk and running around town. What are the latest trends for outdoor clothes you can wear in the city to grab a coffee or run errands? Overall we've seen lifestyle shoulder-season jackets develop a more streamlined, tailored look and they've become lighter in weight without compromising warmth or weather resistance. Jackets that incorporate a synthetic shell with a DWR (durable water repellency) treatment and a warm plush lining made of lightweight high-loft fleece. Light insulation is another big trend we're seeing in lifestyle-oriented outerwear. With waterproof-breathable fabrics and soft insulation between you and the wind chill, these jackets keep you warm without the bulk of traditional insulated jackets. We are really excited about Nau this season. Nau is a Portland Oregon-based company that designs beautiful, highly innovative, technically sound pieces using renewable, organic and recycled fabrics. Their fashionable designs stand up to the elements. What are the hot colours this fall? For fall 2014 we're moving away from bright fluorescent colours towards heritage jewel tones. Longsleeves for men and women offer a high-performing base layer that incorporates this colour trend. How to choose the best materials to wear for rainy days? Snow days? Cold but dry days? In general we recommend incorporating a base layer, a mid-layer and a shell when dressing for varied weather. A base-layer with a polyester blend for men and woman that is quick drying, antimicrobial and a slim fit moves easily under other layers works great. Merino wool is another great base-layer option because not only does it keep you warm, it doesn't hold smell, doesn't itch, is naturally anti-bacterial and wicks sweat away from skin. Wool also has a lifestyle aesthetic compared to similar polyester options. A good shell protects you from the wind and the rain. For rainy, warmer days, a base layer and a light shell should suffice. Cold, dry days would require a base layer and a mid-layer or an insulated jacket like the MEC Light Degree Hoodie or the MEC Uplink Jacket. If wind and rain is added to a cold day, then include a shell on top of the base and mid-layer. How to care for these clothes? Most outdoor clothing is easy to care for. We find that some of our customers are weary of washing and drying clothing with a DWR waterproof coating. In fact, apparel that incorporates a DWR treatment needs to be cleaned and dried frequently in order to maintain its performance. Body oils, sunscreen and dirt impedes DWR but can be reactivated with a wash and dry. Incorporating lightweight, packable layers means you'll never be caught off guard. We love our fair trade organic T-shirts, but don't recommend wearing cotton while being active. Cotton retains perspiration and can weigh you down. Instead look for polyester blends or merino wool for your base layer. Stay tuned to my blog and share your comments below. Your tips and suggestions are always welcome, as I continue on my journey to enjoy life to the fullest.